Whether it’s rafting down the Chattooga River, hiking along the Bartram Trail, or sea kayaking around Cumberland Island National Seashore, Georgia is chock full of opportunities for outdoor enthusiasts of all abilities. To help these adventurers on their way, The Best in Tent Camping: Georgia reveals the best places in the Peach State to pitch a tent. Written to steer campers away from concrete slabs and convoys of RVs, The Best in Tent Camping: Georgia points tent campers to only the most scenic and serene campsites in the state. Painstakingly selected from hundreds of campgrounds, each campsite is rated for: beauty, noise, privacy, security, spaciousness, and cleanliness. In addition, each campground profile provides essential details on facilities, reservations, fees, and restrictions, as well as an accurate, easy-to-read map, making the campground a snap to locate. Georgia is a great state for outdoor lovers, especially tent campers. Before writing this book, I grabbed my tent, laptop computer and hopped in my Jeep, camping from the mountains to the sea, typing up literal on-site campground reports by night. I found the best in tent camping, weeding out the duds that use our precious time. The vast and varied landscape is evident to all in the Peach State. Today tent campers can enjoy these parcels, each distinct regions of Georgia. You can camp on a genuine sea island at Fort McAllister State Park. The sand ridge forests are well represented at General Coffee State Park, where the Seventeen Mile River slips silently beneath a swamp forest. The ridge and valley country of northwest Georgia stands out at Cloudland Canyon State Park, where vertical stone bluffs allow vistas into deep chasms. The mountains of north Georgia, home of the Chattahoochee National Forest, offers recreation destinations aplenty, from streamside trout fishing venues on the Toccoa River to camps adjacent to wilderness areas, such as Tate Branch, to high country destinations where the summers are cool, such as Black Rock Mountain State Park. Georgia is blessed with lakes aplenty from Lake Seminole on the Florida border, where Spanish moss sways from the lakeside forests to Lake Hartwell, a busy and large recreation lake in the Savannah River basin. And there’s Lake Conasauga in the northwest, an impoundment 3,400 feet in elevation. More lakes await throughout the state. All this spells paradise for the tent camper. No matter where you go the scenery will never fail to please the eye. And outdoor activities are plentiful, from canoeing, fishing, hiking, swimming, boating or just relaxing around the campfire. 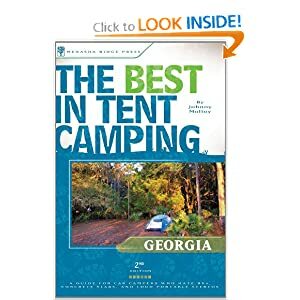 Included in this book is a rating system for Georgia’s 50 best tent campgrounds. Certain campground attributes — beauty, site privacy, site spaciousness, quiet, security, and cleanliness/upkeep — are ranked using a star system. Five stars are ideal, one is acceptable. This system will helps readers find the campground that has the attributes they desire. This small campground is located in a cool, high valley. From Blue Ridge, GA, where US 76 and GA 5 diverge, head north on US 76 for 3.7 miles to Old State Road 2. A sign will say “Old S. R. 2.” Turn left here and follow Old State Road for 10.6 miles to Watson Gap, located at the intersection with Forest Road 64 and Forest Road 22. Turn left on FR 64 and follow it 4 miles to the campground, on your left just after the bridge crossing South Fork Jacks River. The forest service should consider renaming this campground. For starters, it is on South Fork Jacks River, not the Jacks River. And the days of this streamside area being fields are just about over. The forest is reclaiming the fields that once ran down this ridge-rimmed valley. But what’s in a name? What we do have is a small, pretty campground in a quiet nook of the Chattahoochee National Forest. Water and land based recreation is immediate at hand. If you like hiking long trails, two of the longest in the Southeast converge in this area. South Fork Jacks River is born on Flat Top Mountain to the southeast. This mountain also forms the eastern flank of the valley. Pink Knob and the ridge upon which it stands borders the river to the west. Chilly mountain waters flow from these high ridges. The campground lies in a flat where a small, unnamed stream meets South Fork Jacks River. A ranger cabin once stood at the site. It was likely a homesite before that. Nowadays, a small gravel loop circles the campground, which still is partly open overhead, especially in the middle of the loop. Campsite #1 actually sits on part of the concrete slab that was once the cabin foundation. This slab, with some additional site work, has been turned into an all-access site. The small, unnamed stream gurgles nearby in the shade of rhododendron. Curve down toward the river, passing campsite #2, which is partly shaded by tulip trees. Campsite #3 is also along the small stream. Campsite #4 is the most popular campsite. It is located at the confluence of the small stream and South Fork Jacks River. Notice the peeling bark of the yellow birch trees here. Yellow birch trees grow in cool climes, which this high valley is in. Campsite #5 is directly along South Fork Jacks River, which at this point is 10-12 feet wide. A beaver pond is just below the campground here. The gravel road turns away from the river, though campsite #6 is not far from the water. I stayed in campsite #7 because the white pine tree here afforded deep shade. A pump well and new vault toilet center Jacks River Fields. A dirt road leads across the unnamed stream up to a small clearing. This is the small equestrian camping area. A gravel parking area lies next to the clearing, which is broken with boulders. A tall white pine shades the clearing center. There are no campsite amenities here, but there are horse hitching posts in the woods adjacent to the clearing. A small footbridge also connects the equestrian area to the main campground. The entire campground fills only during summer holiday weekends. The pump well is closed during winter. However, if you want some real mountain water, a spring is located just across the unnamed stream on the dirt road leading to the equestrian camping area. The rocked in spring has a pipe for easy access. Be apprised this chilly water, likely the water source for the old ranger cabin, is untreated. Trout fishing is popular around here. Wily brown trout ply the South Fork Jacks River. Most fishing is done downstream. The South Fork Trail starts at the road bridge crossing South Fork and heads downstream. It is but 10 minutes of walking to meet the Benton MacKaye Trail. If you take a right on the BMT, this trail goes more miles than you can walk in a day to its southern terminus atop Spring Mountain, also the terminus for the Appalachian Trail. Its only .6 mile to Forest Road 64 at Dyer Gap and 2 miles to the top of 3,732 foot Flat Top Mountain and the site of an old fire tower. Or you can go downstream along South Fork Jack River, through hemlock woods broken by more open areas (The Benton MacKaye Trail at this point runs in conjunction with the South Fork Trail). The South Fork is never far away, slicing through gorges into deep pools and sometimes widening where old fields once were. Beavers have dammed many parts of the river. It is 1.6 miles to the point where the Benton MacKaye Trail leaves South Fork in Rich Cove. The South Fork Trail keeps forward to soon end at Forest Road 126. Mountain bikers make a loop by turning right on FR 126 to reach Watson Gap, then turn right on FR 64 and follow it to Dyer Gap and down to the campground. The Pinhoti Trail, a long distance path connecting the mountains of Alabama to North Georgia. It currently traces the nearby Mountaintown Creek Trail and will connect to South Fork Trail from the west. Call ahead at the ranger station for the latest Pinhoti information. While you are at it, order a Chattahoochee National Forest map before you come. And when you come, you will find that despite the misleading name, it is no mistake to tent camp at Jacks River Fields.